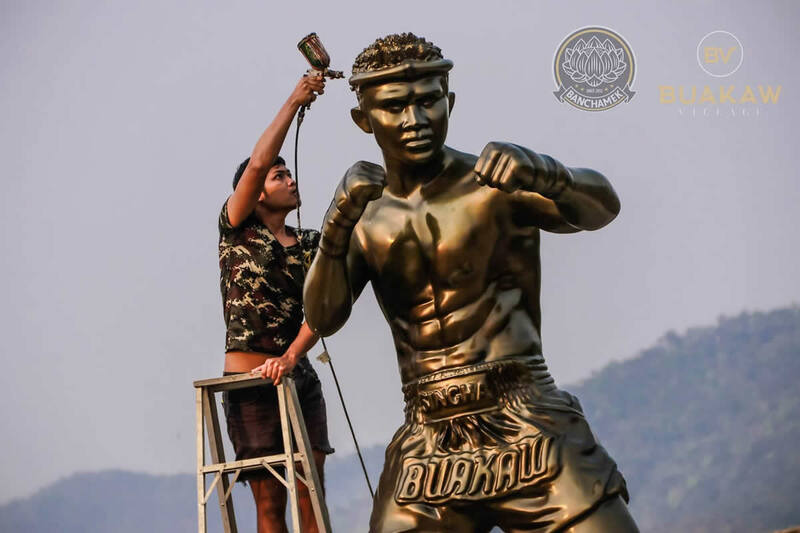 Double life size statue of Buakaw Banchamek was placed in Chiang Mai this past Sunday (Mar. 17). The happening marked the seventh anniversary of “Banchamek Gym” that was relocated from Bangkok to the city in mountainous northern Thailand last April. Buakaw gained his fame mid 2000’s during the heyday of K-1 kickboxing promotion in Japan. Representing Por. Pramuk Gym at that time, he twice earned prestigious K-1 World Max Grand Prix scoring the victories against John Wayne Parr, Albert Kraus, Andy Souwer, among others. Ultimately “The White Lotus” has arguably become the first Muay Thai fighter to have a statue established in his honor. He joins the all-time boxing great Muhammad Ali, as well as cinematic representative of The Sweet Science Rocky Balboa, portrayed by Hollywood superstar Sylvester Stallone. In his previous outing earlier this month Buakaw Banchamek defeated Artem Pashporin by a unanimous decision. Riding the six-fight win streak he is scheduled to face Chinese Yi Long for the third time this October in Hong Kong.